TRUCK ADS® Frames with SECUR-TABS® fasteners permanently bond to most non-porous, flat, smooth surfaces. If you need to remove the frame and residue, it can be accomplished with these tools. 1. Use portable air or electric tools with 500-4,000 RPM. Common 3/8" drills are especially appropriate. 2. Properly tighten holder in collet or chuck of tool. 3. Line up wheel and mandrel threads. Spin the wheel with low force until it contacts the mandrel flange. The wheel will self-tighten to adequate grip during use. DO NOT OVER TIGHTEN. 4. Optimum speed is 2,000+/- 200 RPM. DO NOT EXCEED 4,000 RPM. 5. With tool running, lightly press the outer edge of the wheel to the frame residue. 6. Move tool in counter direction to the rotation direction of the wheel. Note: The wheel is not recommended for use on thermoplastic paint (nitrocellulose or acrylic lacquers) or thermoplastic parts. Caution: Do not exceed the max. operating speed or the wheel can break apart and injure operator and bystanders. Always use protective eyewear and/or face shield as recommended by ANSI Standard Z87.1. Product Use: There are many factors that can affect the use and performance of the frame removal wheel in a particular application; the surface that the frame is bonded to, the surface preparation, the conditions in which the product is used, and the time and environmental conditions in which the product is expected to perform are among the many factors that can affect the use and performance of the TRUCK ADS® Frame System. 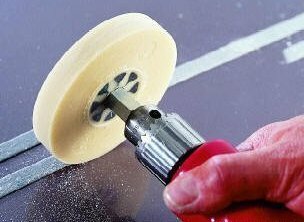 Given the variety of factors that can affect the use and performance of the system, some of which are uniquely within the user's knowledge and control, it is essential that the user evaluate whether using the frame removal wheel or chisel is suitable for the user's method of removal. User is responsible for determining whether the frame removal wheel and chisel are fit for a particular purpose and suitable for user's method of removal. Optional Removal Method: Another method of removing the adhesive residue, due to the limitations outlined above is lacquer thinner, Grimco Rapid Remover and other commercially available adhesive removal products. After the frame is removed and all that remains is the adhesive residue, apply the liquid material to a cloth rag and wipe it onto the surface where the residue is located to loosen the bond, followed by a dry rag to force the residue from the surface. Be careful to not use too much liquid removal material or it might damage the paint surface. Removing the residue with the Frame Removal Wheel is faster and easier than solvents or adhesive cleaners. The wheel is also non-combustible to reduce fire danger. Resilient rounded edge follows contours and irregular surfaces. Residue comes off without scratches or damage to acrylic enamel or urethane paint. Order this item from our iStore. Recommended Operation for Chisel: Use the chisel by hand or in an air chisel gun and quickly separate the TRUCK ADS® Frame and SECUR-TABS® from the mounting surface. The tool's steel reinforced handle and flexible blade will last many years. Order this item from our iStore. Technical Information and Data: The information and data, recommendations, and other statements provided here are based on tests or experience which TRUCK ADS® believes to be reliable, but the accuracy or completeness of such information is not guaranteed. Additional Information: Request additional information: Call 1 (800) 878-2523.